A new home purchase is often an emotional decision so if you want potential buyers to fall in love with your home, their first impression is everything and you only get one shot at it. So that means start with curb appeal that makes them want to see inside! Here are some tips to get your home market ready …..or just some inspiration for your home projects! The most obvious thing is the condition of your lawn and front yard and you can spruce that up with little or no cost! For example, if your flower garden is looking unruly and your front lawn is patchy or overrun with weeds, or maybe remnants of last summer’s plantings are still in your pots…not judging by the way…mow the lawn and add some new sod if necessary, pull the weeds and get rid of the mess! Also, adding red cedar bark or coloured landscape stones goes a long way to freshening up flowerbeds especially at this time of year when plants are small or non-existent. A well maintained yard is an indication of how you maintain your home and it’s the first thing they will see. It doesn’t need to look like the cover of Better Homes & Gardens, it just need s to look neat and well cared for. Adding planters (even store bought, ready-made ones which are now readily available) can go a long way toward creating a welcoming streetscape. They not only add colour and personality, they send a message that you enjoy and care about the surroundings of your home. And if you have a porch large enough to accommodate furniture, stage it with a bistro set or a pair of comfy patio chairs and a table as well as some container plants or hanging baskets. If you have flowerbeds, adding larger mature plants is a lot easier than buying several flats of annuals and it will give a greater impact of larger plants and instant colour. Since your driveway is one of the first things a prospective buyer will notice, it’s a good idea to freshen it up. Adding a sealer to an aggregate driveway and cleaning off any stains from cars parked on the driveway and simply sweeping off any loose stones can make a big difference. 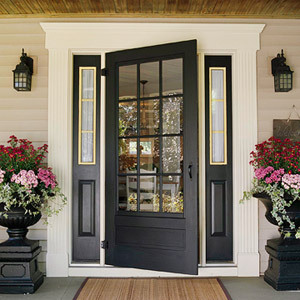 If adding new windows is not in your budget then you want to do what you can to make them look their best. Have them clean and sparkling before you list your home and they will look better from the outside and also improve the view from the inside! Matched blinds or draperies can also add consistency to the exterior appearance of your home so you may want to go outside and take a look at what people see when they look at your home for the first time. Adding simple venetian blinds, or any blinds that are the same style, to street facing windows can add consistency to your home’s exterior, and have an impact on the inside as well as outside of your home. Adding a new mailbox, house light and cool new house number is a great and inexpensive way to update your home’s exterior! The big home improvement stores carry well-priced and yet stylish options for all of these items. When the time comes for you to make a move, we are here to help!